The very first day Seattle’s Pike Place Market opened in the summer of 1907, hundreds of eager customers snatched up all the farm-fresh goods in a matter of hours. By noon, there wasn’t a scrap of produce left as the farmers’ wagons began to roll out. When we set up shop here in 1971, we knew our success would depend on how well we could cater to this insatiable appetite for freshness. Naturally we took up this challenge with gusto, offering superlative brews day in and day out. 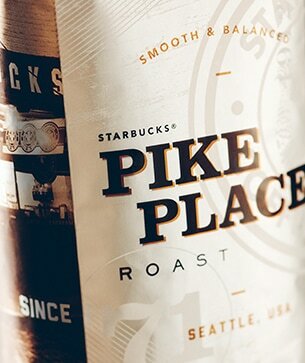 Pike Place® Roast is as much a celebration of our proud history at the market as a heartfelt toast to our discerning customers. We created this blend to meet a wide range of tastes. Whether you prefer it straight up or complemented with cream and sugar, we promise a bold, satisfying cup that’s rich in flavor yet balanced enough to enjoy every day. Pike Place is a trademark or registered trademark of The Pike Place Market PDA, used under license. Enjoy with a cup of yogurt and the morning news.